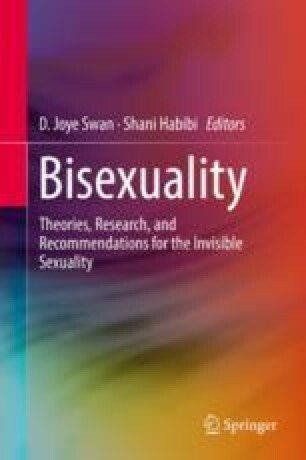 This chapter addresses issues related to bisexual men, including the population size of bisexual men in the USA, bisexual stigma such as stereotypes and erasure, identity development and disclosure, bisexual men’s relationships and health, and mental health resilience among bisexual men. While the reported number of bisexual men is increasing in the USA, they still face considerable levels of stigma from both heterosexual and gay and lesbian populations. In particular, large numbers of nonbisexual people in the US stereotype bisexual men as likely to be HIV-positive or have other sexually transmitted infections. Further, bisexual men are often erased in both scientific research and society at large. Bisexual stigma may have consequences for the identity development, relationships, and health of bisexual men. However, there is some research that highlights the positive experiences and resiliency of this population. Future research should include bisexual men as an independent group and, in particular, attention should be paid to be more inclusive of bisexual men who experience marginalization as a result of race, gender, and disability. Carey, B. (2005, July 5). Straight, gay, or lying? Bisexuality revisited. New York Times. Retrieved from http://www.nytimes.com/2005/07/05/health/straight-gay-or-lying-Bisexuality-revisited.html.